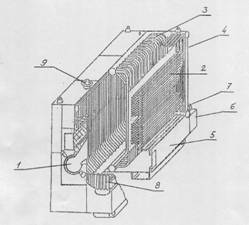 The boiler type KVV-2,0 Gn is intended for use in heating and hot water supply systems. 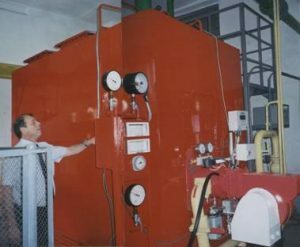 The boiler has a P-shaped arrangement and consists of a firebox, the screens of which are drawn from pipes of 51×3.5 mm in diameter, welded with fins, and the convection part made of U-shaped pipes with a diameter of 28×3 mm, which, in turn, are welded into risers , and those – in the collector. Made in the form of a welded gas-density monoblock in a light insulation and decorative casing, it is completed with a block gas burner of low pressure with a system of automation. The implementation of the boiler will allow the replacement of obsolete boilers of the type “Minsk-1”, “NIISTU-5”, “Universal”, “Energy”, etc., to increase the heat capacity of boiler houses 3-5 times without changing their building volumes, dramatically increase efficiency and reliability sources of heat supply. The boiler was developed by the Institute of Industrial Ecology in cooperation with ITTP NASU, conducted by JSC “Krymteplocomunenergo”.